Huckletree West opened in White City Place in 2017 and we were chuffed to welcome them – along with their pom-pom clouds! 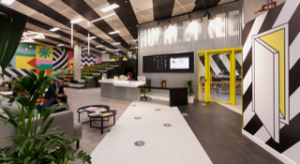 Huckletree West is a workspace accelerator for startups, scaleups, entrepreneurs and corporate innovation teams across the tech, media, fashion and design industries. Designed in partnership with award-winning architectural practice Studio RHE, Huckletree West features uplifting colour pop murals, a hand crafted pom-pom cloud suspended from the ceiling and extensive urban gardens. Huckletree encourages members to bring their whole selves to work, offering a no-tech Meditation Yurt for ditching devices and recharging, alongside weekly guided yoga sessions. A Power Parents membership is aimed at supporting West London parentrepreneurs who are balancing building a startup and raising a family. Membership includes flexible working hours in an on-site Kids Studio.